Yesterday we finally had some rain and I had to pretend I was upset about walking to work in my Wellies (I’d wear them round the house if my husband would let me!) The garden needs it as it has been quite dry; the leeks and celeriac are particularly deserving, and the Zinnias protest loudly if they don’t get enough rain. I also think the Dahlias flower better after a refreshing drink. So winter is coming and the mornings have been sharply cold... I am not sure if this is a bit more advanced than last year. 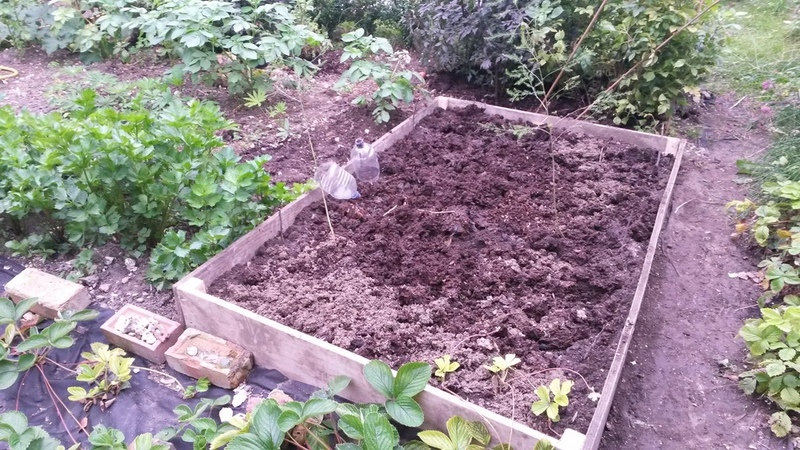 But I have been busy nonetheless with my latest project to try and resolve one of my main problems in the potager – gardening on a slope. Not only does this mean there is an inevitable frost-pocket at the bottom, but the water just runs away from the plants in an alarmingly literal manner! So I’ve decided to plop for raised beds and have been gleefully power-sawing up bits of wood into planks and, so far, I have one in situ. This is the most important bed: for the Asparagus. They were not happy this year as I decided to try and make the most of my small space but overplanting them with Sprouts!! Yes it was a disaster. A bit like putting a Vogue catwalk model with a bit of rough from the bus stop. Vogue was distressed by the lack of water and disrupted by BitofRough’s deeply rooting sprouty ways. To move on from such metaphors, I put in 2 bags of horticultural sand, 2 bags of horticultural grit, 2 bags of well rotted horse manure, and still it is not satisfactorarily level with the top! The Vogue of the plant world, (ie extremely delicate and fussy) has been ensconced and we’ll just have to wait and see now if she puts her feet down or gives up. I like the effect of the raised bed, it seems quite chic and well-ordered which appeals to my Germanic roots I suppose. But I am worried I’ll be even more limited than before in terms of usable space.